The high forests of the Natural Reserve are the ideal habitat for the smallest nocturnal raptor in Europe. 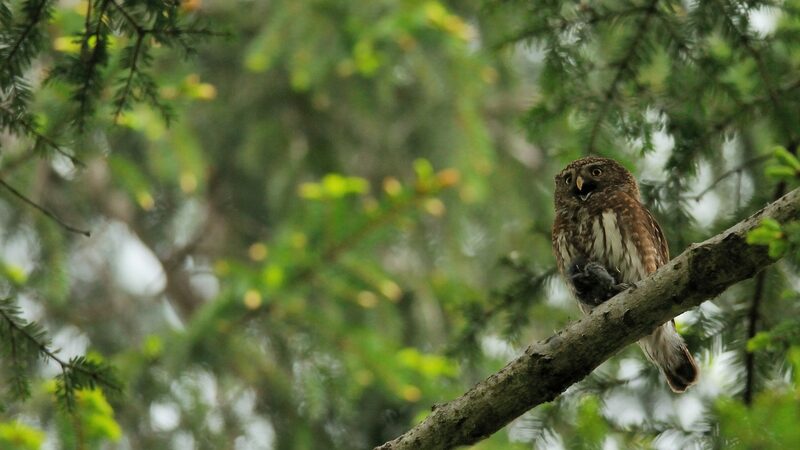 As well as its “little cousin”, the Tengmalm’s Owl, it is under surveillance within the boundaries of the Natural Reserve (Photo credit: Clovis and Marceau Duraffourg). Spanning a vast area of nearly 11,000 hectares in the Department of Ain, the National Natural Reserve of the High Jura encompasses most of the High Jura range. It stretches some 40 kilometers from the Vaud border in the north, to the narrow gorge of Fort l’Ecluse in the south. This forms the most easterly part of the High Jura massif, covering the narrowest and the highest points of the entire range. The crowning peak, Crêt de la Neige (1,720 m) rivals closely with other peaks along the crest of the range: Mont Rond (1,596 m), Colomby de Gex (1,689 m), Reculet (1,718 m) and the Massif of the Grand Crêt d’eau (1,621 m). As a result of the folding and thrusting caused by the uplifting of the Alps during the Tertiary Era (representing 2 geological periods, the Paleogenic and Neogenic) and the continuous glacial erosion for a further 20,000 years, the geology of the Jura is a tortured one. All forms of Jurassic topography are well represented in its geological formation. When considering the “hills” that sweep west beyond the Valserine valley, numerous faults and glaciers together with the geological action of frost and water have resulted in the formation of anticlinal depressions (Creux de l’Envers), glacial cirques (Creux de Narderans, Creux de Praffion) and have formed cliffs and steephead valleys (Les Voûtes, Defilé des Hirondelles) rock screes, and moraine deposits. Numerous forms of surface erosion such as limestone pavements, sinkholes, hollows and chasms are testimony to the intense karstic activity. The scale of the altitude difference, more than 1,200 metres between the summits and the lowest points, in the foothills and the gorge of Fort l’Ecluse, results in a layered composition of the natural areas. The double orientation of two flanks of the Jura range, south-east for the Pays de Gex and north-west for the Valserine, accentuates these contrasts. The action of the wind sweeping over the crests throughout the year gives rise to extreme conditions of life. The diversity of ecological factors results in great variation of the natural areas, of its wildlife and of its flora.